"This super-fast recipe is the exact opposite of the traditional chard and vinegar that I grew up on and grew tired of. Mildly sweet with a gingery bite." Heat the oil in a large skillet over medium heat. Cook the chopped chard stems, onion, and ginger in the hot oil until they begin to soften; season with salt and pepper. Add the chopped chard leaves to the skillet; reduce heat to low. Continue cooking until the leaves have wilted, about 2 minutes more. Drizzle the maple syrup over the mixture; stir to coat evenly. Remove from heat and serve. This recipe was interesting. The flavor that maple syrup adds is...a little off for me. 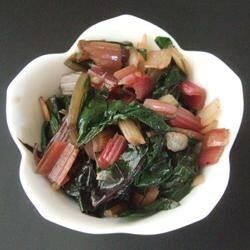 I love dark leafy greens cooked almost any way, but there are better recipes than this for chard. Really good. Added a bit of lemon to it and used honey instead of maple. Same effect, delicious dish. Love this recipe with 2 personal modifications: chopped fresh garlic to the onion/ginger/stems... and instead of maple syrup, I drizzle Agave Nectar! Edited review - the recipe has now been corrected, and it's now accurate. What a gem of an idea. The ginger takes boring old swiss chard to a new level. I think the next time I make this I will add a clove of garlic too. Thanks WyndWoman, this is a keeper. The maple syrup on this was amazing! I did not have fresh ginger so I used a little powder, probably not the same, but it turned out perfect anyway! Thanks for a great recipe!